Director – Sam Raimi, Screenplay – Mitchell Kapner & David Lindsay-Abaire, Based on the Books by L. Frank Baum, Producer – Joe Roth, Photography (3D, some scenes b&w) – Peter Deming, Music – Danny Elfman, Visual Effects Supervisor – Scott Stokdyk, Visual Effects – Digiscope, Evil Eye Pictures (Supervisor – Matt McDonald & Daniel P. Rosen), Luna Pictures (Supervisor – Vincent Cirelli), Method & Sony Pictures Imageworks, Special Effects Supervisor – John Frazier, Makeup Effects – KNB EFX Group, Inc (Supervisors – Howard Berger & Greg Nicotero), Production Design – Robert Stromberg. Production Company – Roth Pictures/Curtis-Donen. Kansas, 1905. Oscar Riggs is the shabby travelling carnival magician billing himself as Oz the Great and Powerful. Oz delights in tricks of simple illusion but is also a cheap conman. 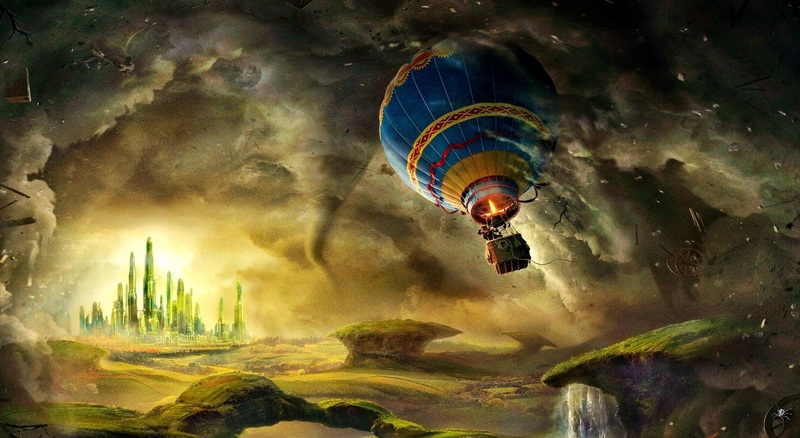 Fleeing from an angry strongman with whose wife he has been dallying, Oz jumps aboard a hot-air balloon – only for it to be whisked away in a tornado. The balloon comes down in the magical land of Oz where Oz is amazed at the strange creatures and things around him. He is discovered by the beautiful Theodora, a witch who tells of a prophecy about a great wizard who will come from the sky. Readily agreeing to take on this role after discovering that it makes him the ruler of the land and inheritor of great wealth, Oz travels to the Emerald City with Theodora to inherit his crown. Theodora’s sister Evanora tells him that he can only do so after killing the Wicked Witch of the South. Accompanied by a loyal talking monkey servant Finlay and a tiny china girl he patches up along the way, Oz sets out to defeat the witch, only to find that this is Glinda the Good. Evanora is in fact a wicked witch. She now manipulates Theodora into thinking that Oz has betrayed her and to take a bite of an apple that causes her to relinquish all goodness and becomes evil and green-skinned. Glinda persuades Oz to accept the mantle of the destined wizard and to unite the Quadling, Munchkin and Tinker peoples into an army to dethrone the two witches. Without any real magic, Oz realises that his only option is to use illusion and trickery to win the war. The Wizard of Oz (1939) starring Judy Garland is without a doubt a genuine piece of American fairytale mythology. It was based on The Wonderful Wizard of Oz (1900) by newspaper editor L. Frank Baum. The book was an instant children’s classic and Baum wrote thirteen follow-ups that told the further adventures in Oz and among its peoples. Baum even oversaw and directed several film adaptations during the silent era. The 1939 film is an indisputable classic – it is this that people’s conception of the story and characters come from rather than the books. It has been enormously influential, having been unofficially sequelised, modernised, spoofed or referenced in dozens of other films. Disney purchased the rights to L. Frank Baum’s books in 1955. The only productions that this led to was Return to Oz (1985), a serious film sequel that adapted elements from other Baum books, although this was a box-office disappointment but is in itself a fine film, while Disney were also responsible for overseeing The Muppets’ Wizard of Oz (2005). Sam Raimi is a director with a lengthy genre history. Raimi first appeared with the cult splatter hit The Evil Dead (1981) and its better-budgeted sequel The Evil Dead II (1987). These were highly influential on the makeup effects driven horror comedy film of the 1980s. Raimi went onto other works like the dark avenging superhero film Darkman (1990) and a further Evil Dead film Army of Darkness (1992) but then appeared to abandon genre material and to become a serious director with the likes of the Western The Quick and the Dead (1995), the thriller A Simple Plan (1998) – still his best film, and the increasingly banal likes of the Kevin Costner baseball drama For the Love of the Game (1999) and the clairvoyant thriller The Gift (2000). He made a return to the genre in the 00s with the trilogy of Spider-Man (2002), Spider-Man 2 (2004) and Spider-Man 3 (2007) films, which were among the most successful of the modern Marvel Comics screen adaptations. The scriptwriters for Oz: The Great and Powerful appear to have taken their lead from the recent hit of Alice in Wonderland (2010), Alice in Wonderland gave us popular children’s tales being reinvented as epic fantasy adventures, which in turn begat the likes of Snow White and the Huntsman (2012) and Jack the Giant Slayer (2013). Or perhaps even more so before that there was Star Wars Episode I: The Phantom Menace (1999), where a familiar story was taken and another story written about the events that led up to it. This prequel-itis – or if you want to give it an academic term, mythopoeia, the creating of an artificial mythology – has infected a number of other cinematic series in recent years. Oz: The Great and Powerful exists to embellish the backstory behind the 1939 film, covering how a shabby conman conquered the land with his brand of fake magic and became the Wizard of Oz; giving an origin story for the Wicked Witch of the West and her sister; and back histories for familiar characters like Glinda the Good. Oz: The Great and Powerful is not alone in searching to create a mythopoeia for The Wizard of Oz – there also is the enormous success of the Broadway musical Wicked (2003), which similarly tells an origin story of the Wicked Witch of the West (although a very different and far more sympathetic one than the one told here). The film keeps a balance of elements from the 1939 film and new ones that are introduced from the L. Frank Baum books. Sam Raimi retains much of the look of the 1939 film – the design of the Emerald City, the Yellow Brick Road, the field of poppies, the look of all the familiar characters including the Wicked Witch in green skin, black hat and travelling on her smoke-spouting broom, Glinda in her glycerine bubbles and so on. There is even same narrative device of the opening scenes in Kansas being shot in black-and-white, switching to colour with the arrival in Oz, as well as the mirror device where the characters in Oz have analogous counterparts in Kansas. The one thing this version is not is a musical, although the film spoofs this at one point, having the Munchkins breaking out into song in the midst of battle plans before James Franco has to tell at them to stop. At the same time, the film also introduces elements from the book that were cut from the 1939 film – the visits to the land of the Quadlings (who according to the book had no arms but are rewritten here as farmers) and the china doll people. What this film does lack is the purity and innocence of a homespun American heartland fairytale that the original created so indelibly. This is a far more modern and knowing film at times – apart from a Baum circus at the beginning, Sam Raimi welcomely resists the opportunity to inundate the film with nods and winks – but the characters have a certain modern cynicism and glibness. Mindedly, it is unlikely that the original film could ever be made today and win over audiences the way it did – people were far more accepting of larger than life virtues back then and by contrast seem a good deal more jaded today. More so though, the story lacks the purity of the original’s quest for virtues. Its’ central character is a wily conman who is hoodwinking an entire land, which is markedly different from Dorothy who was a sweet innocent child just wanting to find her way home. What this film does offer in the stead of Dorothy and companions’ quest is a very different but equally strong character arc – the redemption of the wily conman/artful dodger who really cares not far beneath his mercenary exterior. Indeed, the film becomes oddly ennobling of Oz’s hucksterism and bald-faced shammery, turning him into a reluctant hero. By contrast, in reading the book you get the impression that L. Frank Baum created the character of The Wizard to make a sardonic comment on the deceitfulness of politicians and by contrast how most of the virtues that one needs to get by in life come not miraculously from without but are under our own noses and merely in need of a little self-recognition. Where Sam Raimi excels is when it comes in being able to lavish some $200 million worth of production design and cutting edge visual effects flourish on transforming the world of Oz for us. Oz is designed as a magical wonderland of the virtual CGI 3D camera that makes one think of something akin to the world of Avatar (2009) by way of the wacky delights of Alice in Wonderland. The world sings with imagination – from the Dr Seuss-like foliage, the river fairies, journeys through the landscape by bubble and the climactic battle that Oz mounts back against the two sisters – in full and resplendent colour. The film’s greatest triumphs however come in the characters – in particular, that of the scene-stealing flying monkey servant Finlay and the utterly adorable china doll girl that insists on joining the party. Her introductory scene where James Franco glues her back together is a heart-rendering delight. Raimi and the scriptwriters pull off some fine dramatic flourishes – in particular, Theodora’s surrender to the dark side and Oz discovering his ability to use his magic and taking on the two witches in a big climactic battle. I could never quite see James Franco in the role of Oz. He seems a little too sharp and cynical as compared to the fuddy old man played by Frank Morgan in the original. However, I went with the casting and Franco carries the part reasonably well. Nor did I quite see Mila Kunis as the Wicked Witch. I kept thinking why not give the part to someone like Jessica Lange who seems to be having the time of her life chewing the scenery in such larger-than-life parts these days – see American Horror Story (2011– ) – whereas Mila Kunis’s only notable quality up to this point has been as another desirable looking Hollywood starlet of the moment – has there really been an acting role Kunis has done that made one sit up and think that she is one of the premiere character actors of the day? It is certainly an interesting change of pace seeing her playing a lovelost innocent in the early scenes. In a similar vein, Michelle Williams (an actress who does have those very character acting chops) makes an appropriately sweet Glinda, although at times seems too demure to be the embodiment of purity that Billie Burke was in the original. 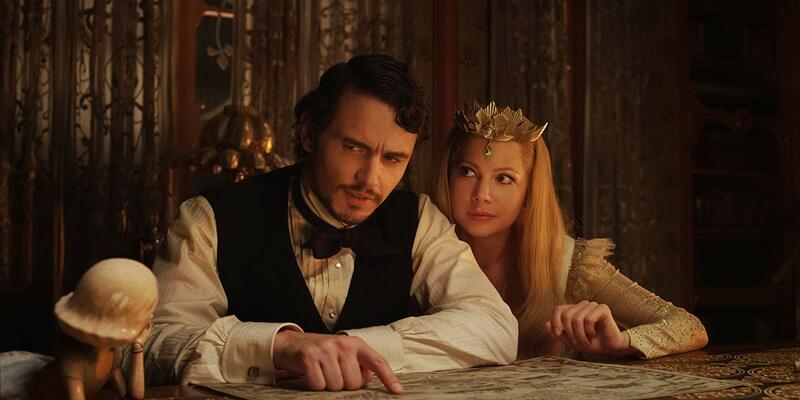 Oz: The Great and Powerful was parodied in The Starving Games (2013). Sam Raimi’s other genre films include:- the splatter comedy The Evil Dead (1981) and its sequels The Evil Dead II (1987) and Army of Darkness (1992); the bizarre cartoonish crime drama Crimewave (1985); the dark superhero film Darkman (1990); the psychic thriller The Gift (2000), and the trilogy of Marvel Comics adaptations Spider-Man (2002), Spider-Man 2 (2004), Spider-Man 3 (2007), followed by the horror film Drag Me to Hell (2009). Raimi also co-wrote the Coen Brothers fantasy film The Hudsucker Proxy (1994) and produces the zombie film The Dead Next Door (1989) under the pseudonym The Master Cylinder. Sam Raimi has also had some success with his Renaissance Pictures production company, who have been particularly enterprising in the field of television fantasy. Theatrically, Renaissance have produced the bizarre Lunatics: A Love Story (1991), John Woo’s American debut Hard Target (1993) and the Van Damme time-travelling action film Timecop (1993). On television, Renaissance have produced such genre works as the superhero series M.A.N.T.I.S. (1994-6), the smalltown Deviltry show American Gothic (1995) and then had enormous hits with the dual successes of the tongue-in-cheek revisitings of Greek myth and sword and sorcery with Hercules: The Legendary Journeys (1994-9) and Xena: Warrior Princess (1995-2001). These were followed by similar tongue-in-cheek series as Young Hercules (1998-2000), the futuristic Cleopatra 2525 (2000-2), the historical romp Jack of All Trades (2000-1) and the Evil Dead tv spinoff Ash vs Evil Dead (2015-8). Raimi has also formed the Ghost House Pictures production company and co-produced the likes of the American remake of The Grudge (2004), Boogeyman (2005), The Messengers (2007), Rise (2007), 30 Days of Night (2007), The Possession (2012), Evil Dead (2013), Poltergeist (2015), Don’t Breathe (2016) and the tv series Legend of the Seeker (2008-10) and 13: Fear is Real (2009). (Nominee for Best Special Effects and Best Production Design at this site’s Best of 2013 Awards).